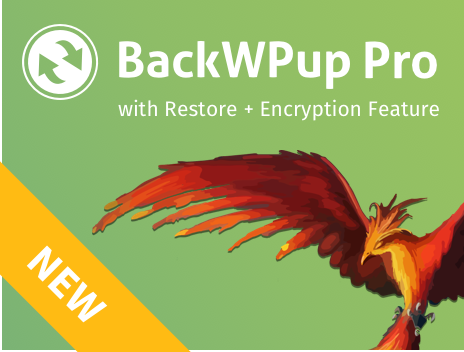 BackWPup version 3.6.4 is a patch release with fixes and tweaks. Take a look at the changes. Now, users will be forced to download the symmetric and asymmetric private keys in order to prevent problems in case they have to restore a backup using the standalone app. There was a problem when users tried to download a file and they were using a Windows server because of get_mime_type function was not found. Do not copy the restore and restore-temp directory when we are restoring a backup for security reasons. Previous versions of the standalone app were not able to restore an encrypted backup. Did you find another bug in BackWPup? Please let us know over at Github. Or do you need support for the free plugin? Please post on our support forum on wordpress.org. We do our best to answer all questions quickly. If you are a Pro user, please contact us via backwpup.com. As Pro user, you get priority support. We will ensure that we resolve your issue as quickly as possible. Thanks for using BackWPup. We appreciate all our users who find value in our plugin. If you have any suggestions, feel free to let us know.